Valley senior Tanner Spradlin signed his letter of intent with Wilmington College Wednesday afternoon at Valley High Schoool. LUCASVILLE – For Valley senior Tanner Spradlin, playing college football has been a dream of his since he can remember. After his signing with Wilmington College at his signing ceremony Wednesday afternoon, Spradlin’s dream became a reality. Spradlin had a fantastic senior season with the Indians, and a big part of that was the talented receiver’s connection with quarterback Andrew Shope. Shope and Spradlin connected during their senior seasons for 27 catches for 423 yards and seven receiving touchdowns, not to mention Spradlin’s 99 yard punt return for a touchdown. 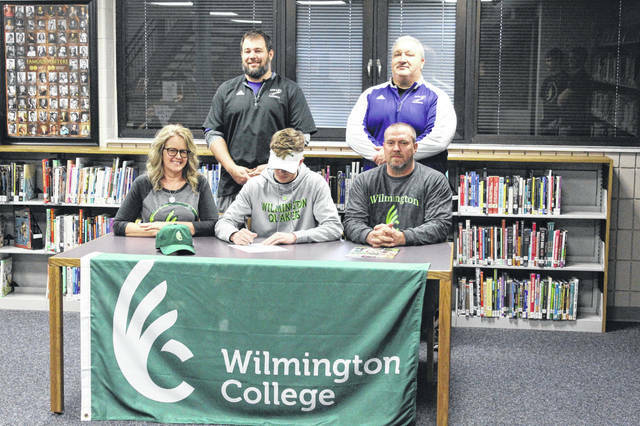 Since Spradlin initially visited Wilmington College, he had little doubt that that would end up being where he would spend the next four years of his life. Spradlin said that upon enrolling at Wilmington this fall, he plans on majoring in sports management. Despite receiving advice along the way from family members and coaches, Spradlin said that ultimately, those around him allowed him to decide where he would continue his playing career. As he moves on to the next phase of his life following graduation this May upon enrolling in Wilmington this fall, Spradlin noted how much his coaches at Valley have meant to him, and how he wouldn’t be in his position today if it weren’t for their influence and guidance. https://www.portsmouth-dailytimes.com/wp-content/uploads/sites/28/2019/02/web1_IMG_9007.jpgValley senior Tanner Spradlin signed his letter of intent with Wilmington College Wednesday afternoon at Valley High Schoool.